Home / Dash of Insight / Stock Exchange: Do You Exit Your Trades When Conditions Get Risky? Review: Will You Adjust Your Strategy Or Go Down With The Ship? Our previous Stock Exchange asked the question: Will You Adjust Your Strategy, Or Go Down With The Ship? Specifically, the latest market sell-off has many investors questioning the appropriateness of their strategies. We highlighted the strength of our technical models in remaining objective and unemotional in their decision-making processes. However, market volatility can also be a good reminder that trading strategies can be adjusted according to dynamic market conditions. This Week: Do You Exit Your Trades When Market Conditions Get Risky? When technical conditions become too negative, our models will exit their current positions. In fact, we were very close to exiting all of our trades this past week, but did not. 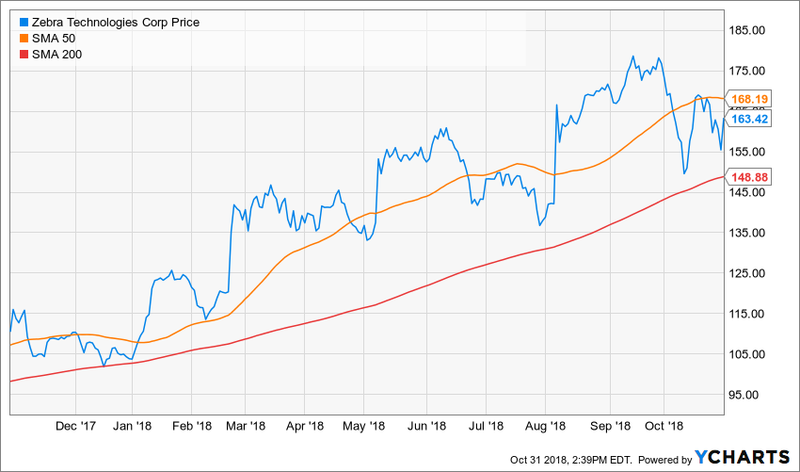 It’s a fine line to walk between avoiding major disasters and maintaining a good risk-versus-reward position. When you are managing your own positions, and conditions get choppy, when do you exit your trades and move to cash? Of course the answer depends on your own personal objectives and trading strategy. For example, if you have a very long time horizon, you might just be content to ride out any volatility and risky market conditions. However, if your time horizon is shorter, you may not be willing to take the risk of riding out the volatility. For example, when markets first got volatile in October 2007, as the financial crisis started, it took years for the market to bottom and then recoup its losses. 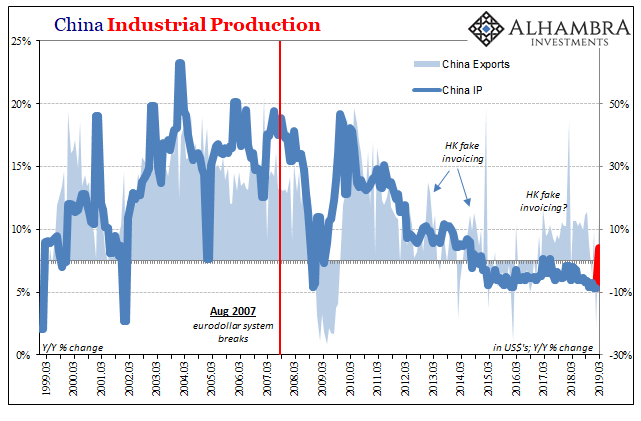 Of course, the market did eventually recover (and then some!) but you simply may not have that long of a time horizon and/or the right disposition. There is most certainly a psychology to trading the markets in many situations. For example, Dr. Brett Steenbarger, offers some excellent perspective on the psychology of navigating a volatile market in his Forbes article from a couple weeks ago. And he also offers more good ideas in this article from just a few days ago: Reading the Psychology of the Market. As we mention often, one of the advantages of our trading models is their objectivity; they’re not subject to the same emotional mistakes that human traders often make. One of the highlights of our trading models is that they do use stop orders to exit their positions in a risk-off environment. However, they are not “static” stop orders, but rather, they adjust based on market conditions such as volatility and volume. As you may be painfully aware, poorly placed stop orders can result in selling near the bottom, and then missing the subsequent rally. That’s why our process is dynamic yet disciplined. 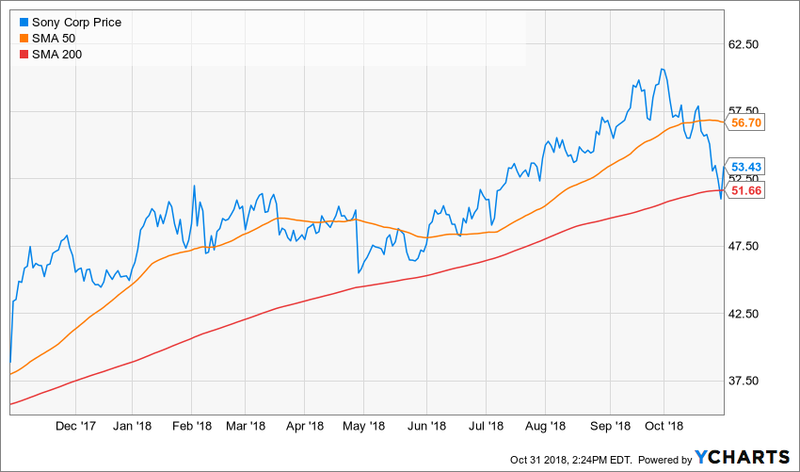 Dave Mabe offers some good perspective on this topic in his recent article: How To Trade When The Entire Market is Moving. He reviews his disciplined trading script in the article, that can be helpful to other traders still honing their own process. Holmes: This week I sold Sony (SNE). I purchased the shares in early October at a slightly high price. Blue Harbinger: I know you like to buy on the dip, Holmes. And I see the dip, but unfortunately this one turned out to be a bigger dip than expected thanks to the market wide sell-off. It’s always important to keep you losses small, so they don’t eat too much into your profits on your winners, so I respect you for getting out of this one at only a small loss. At least you can hang your hat on that. Holmes: I am a technical trading model, not a human–I don’t wear hats. I am objective in my trading process, not emotional. BH: Ok then. 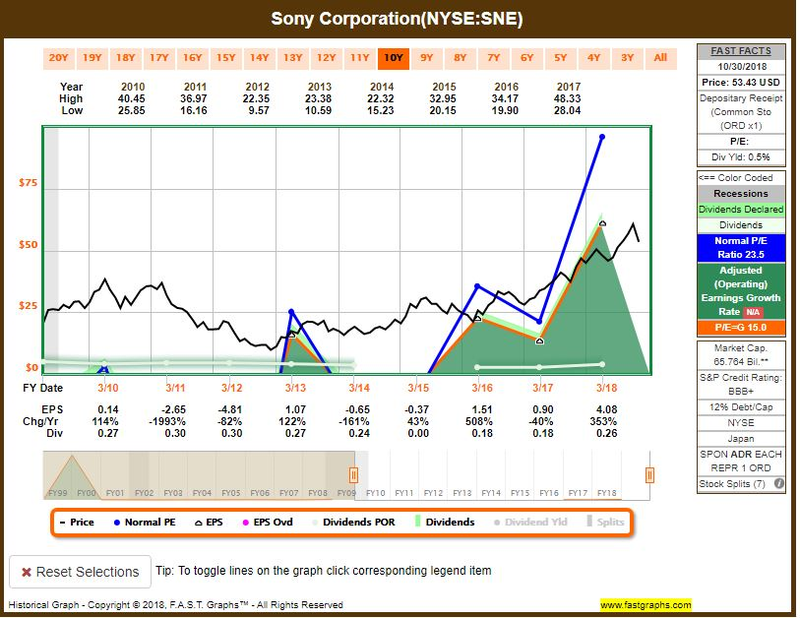 Here is a look at some fundamental data for Sony–maybe you want to objectively consider this? Holmes: I am a technical trader, not a fundamentalist. Besides, earnings are often nothing more than a figment of an accountant’s imagination. BH: For a non-emotional trading model–you seem a little testy this week, Holmes. Nonetheless, thank you for sharing. And how about you, Road Runner–any trades to share this week? 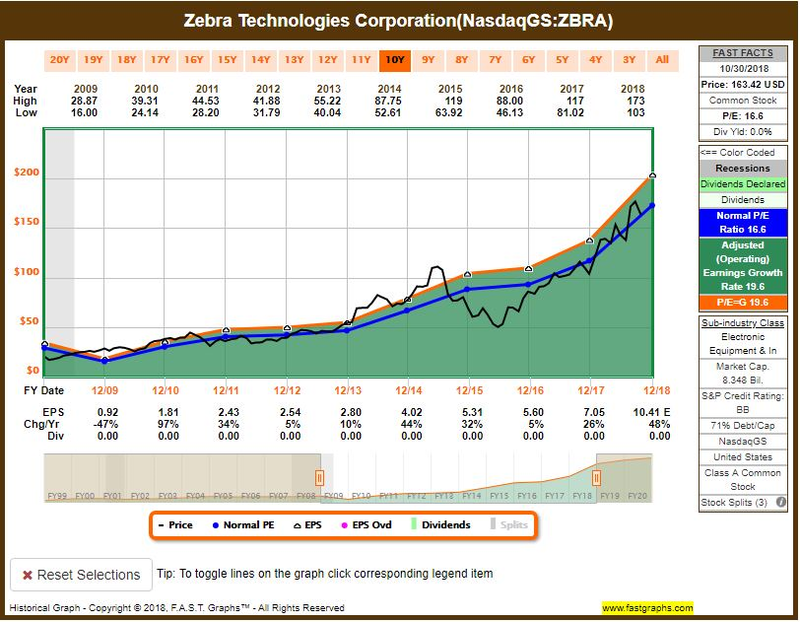 Road Runner: This week I bought shares of Zebra Technologies (ZBRA). It happens to be located in Linconshire, Illinois. About 35 miles from Jeff’s office. BH: I am familiar Linconshire and Zebra–the bar code creation company. It’s quite a clever and appropriate name, considering what they do. Is your model programmed to pick up on the connection between the name and what they do, Road Runner? RR: I see the connection, but I’m not getting overly excited about it like you. I bought the shares because they were in the lower end of a rising channel, as you can see in the following chart. BH: I can appreciate that technical trade. 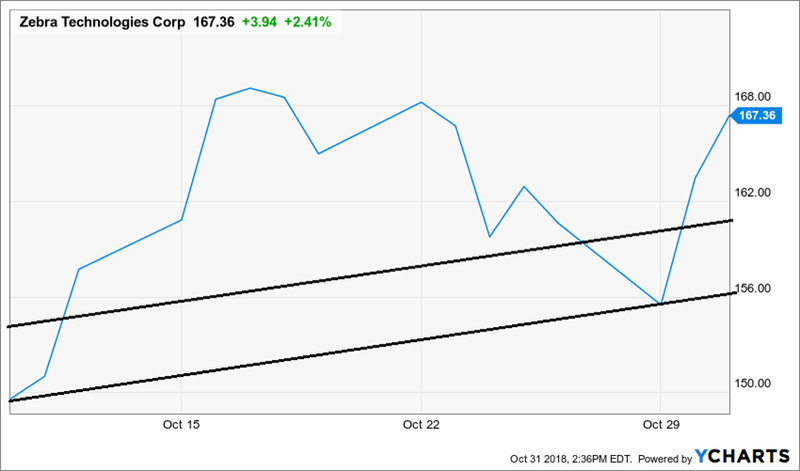 It seems like momentum stocks were dominating the world up through the start of October, and as hard as the recent sell-off has been, the snap back could be even more violent–in a good way. Here is a look at the price (and the uptrend) over the last year. RR: Thanks for your two cents. FYI, I usually hold for about 4-weeks. BH: Then I’ll keep and eye on this one to see how you do. By the way, the fundamentals have been improving too. Here is a look at the Fast Graph to give you some idea. RR: Thanks for the info, BH. 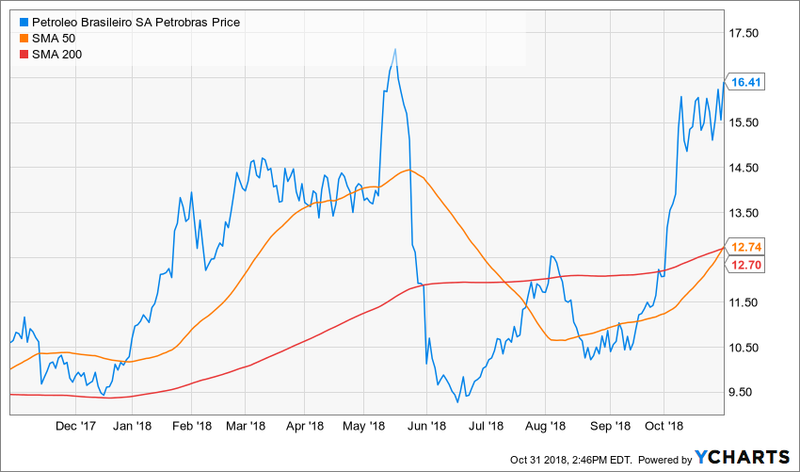 Felix: This week I bought Petrobras (PBR). Do you have an opinion on that? BH: Really? Wow–that’s kind of bold, Felix. Is this a reaction to Brazil’s latest presidential election or is it a bet on energy prices? Petrobras is a Brazilian oil and gas company. Felix: It’s mostly a momentum trade. My typical holding period is 66-weeks, and the technicals on this one look good. BH: Interesting, Felix. Here is a look at some fundamental data in the Fast Graph. Felix: Thanks for that info. By the way, I also ran the S&P 500 through my technical model this week, and my top 20 rankings are included in the following list. BH: Thanks Felix. And how about you, Athena–any trades. Athena: This week I bought Bed Bath & Beyond (BBBY). There was a nice price dip on Tuesday, and I used that to pick up some shares. Here is a look at the chart. BH: Interesting purchase, Athena. 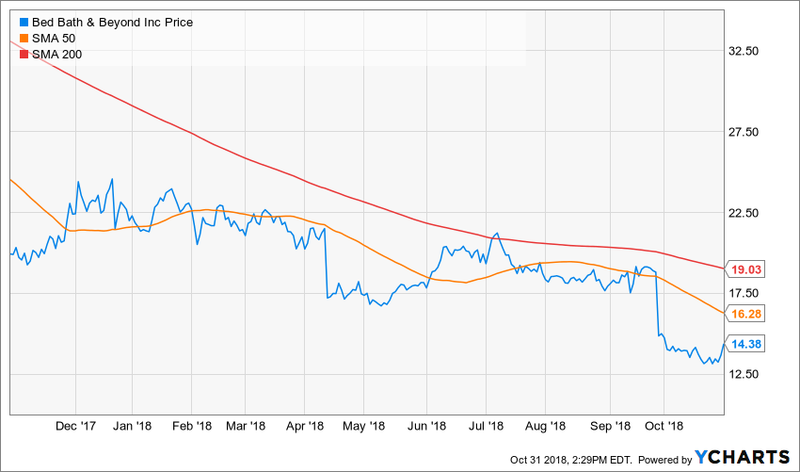 I see BBBY’s earning per share has been going in the wrong direction in recent years, perhaps as a result of the whole downward trend in retail stores, as online competitors advance. 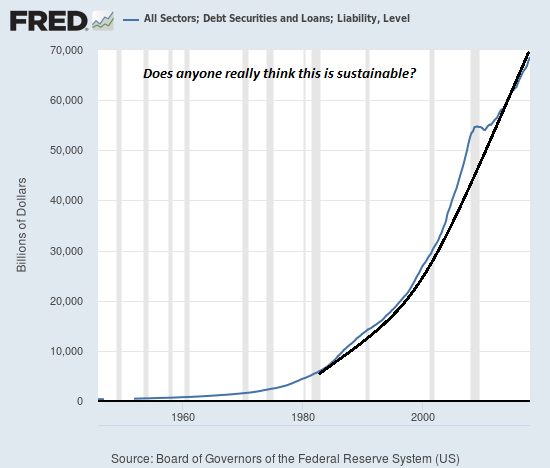 Here is a look at the Fast Graph. Athena: Well keep in mind, my typical holding period is about 17-weeks, so I am looking for different technical indicators. 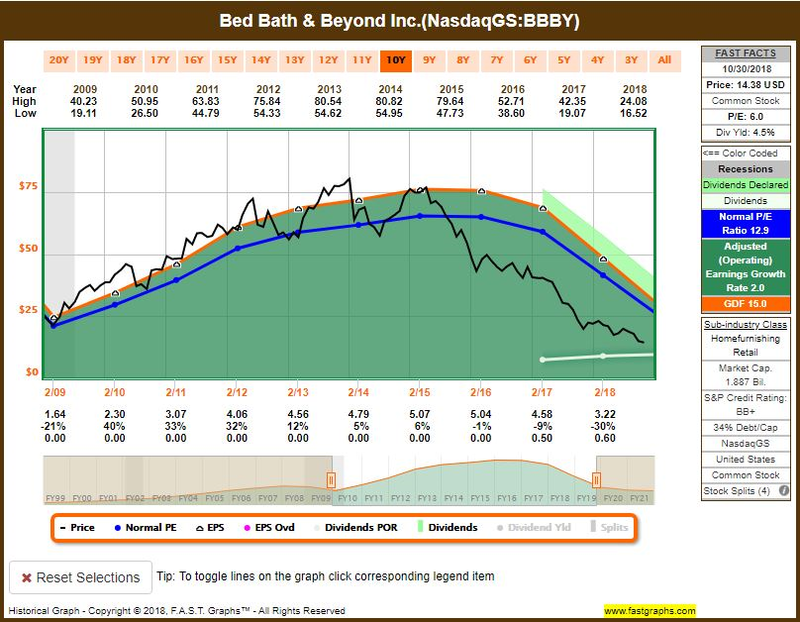 I am actually big on various forms of technical momentum, and BBBY is looking good. BH: Are you sure your just not into the home decor sold by Bed Bath & Beyond as we head into the holiday season? It is November already. Athena: Very funny. Check back in with me on this trade in 17-weeks. How about you, Oscar–any trades? Oscar: No trades, but I did run our universe of “High Liquidity ETFs with Price*volume over 100 million” through my technical model, and the top 20 ranked stocks are listed below. BH: Well surprise, surprise. I see the Brazil ETF (EWZ) and the Oil ETF (USO) ranked #1 and #2. 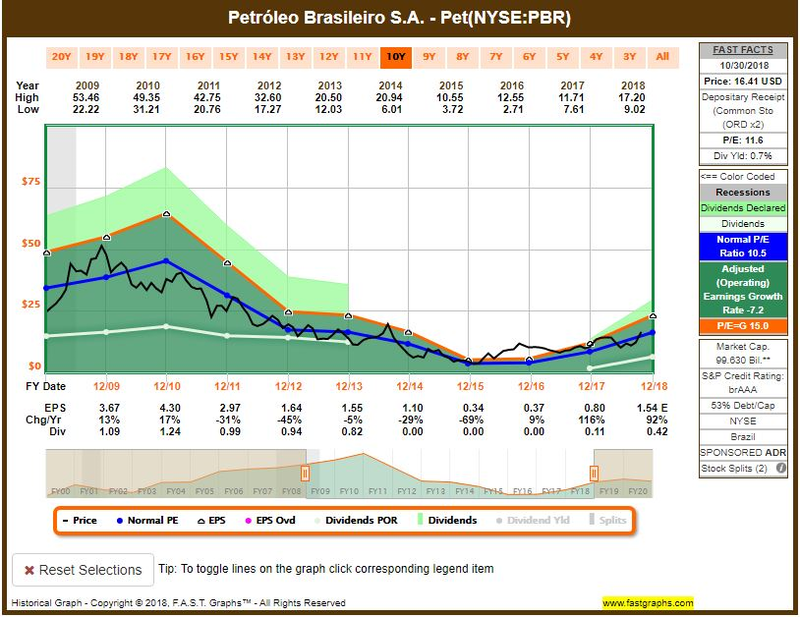 It’s no wonder that Felix likes the Brazilian energy company, Petrobras (PBR). You’re both momentum traders, correct? Oscar: Correct, although our time periods are different. I typically hold for only 6-weeks. And I usually exit by rotating into a new ETF. Steep market wide sell-offs are difficult to deal with. And depending on your goals, you may try to just ignore the volatility, and hold on for the long-term. On the other hand, you may choose to sit out of the market (move to all cash) and wait for the fear and volatility to die down. This can be a challenging strategy to implement considering a poorly placed “stop loss” order can result in selling near the bottom, and then missing the subsequent rally. Dynamic stop loss orders (adjusted for market volatility and volume) can help, but the strategy is challenging nonetheless. As always, your strategy should be designed to meet your own individual needs and goals. Anything less is unacceptable. Previous Weighing the Week Ahead: What do the Mid-Term Elections Mean for Financial Markets?